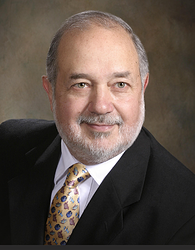 Dr. Charles A. Garcia is a board certified and internationally recognized researcher and clinician. As a graduate of Tulane University, he completed his residency and internship at The University of Texas Medical School at Houston. His post-residency fellowship in Cornea and External Disease was completed under Dr. Dan B. Jones at Baylor College of Medicine in 1970. As a specialist, his clinical practice focuses on the diagnosis of various vitreo-retinal diseases and he has worked throughout his career on finding a treatment for Retinitis Pigmentosa and Retinal Dystrophies. Dr. Garcia has written extensively on his retina research and published more than 175 articles, written three books in English and Spanish as well as published numerous articles in association with the National Institutes of Health. He has presented in numerous ophthalmic societies both in the US and internationally and has been active in training more than 100 post-doctoral fellows from 22 countries including the United States since 1974. As former President of the American Diabetes Association, Dr. Garcia has worked with local community organizations to educate the public about diseases of the eye and diabetes. He participated in more than 15 clinical studies with the National Institutes of Health and the National Eye Institute investigating the progression of diabetic retinopathy since 2004. Dr. Garcia has had a continued commitment to community service and has participated in numerous events including the "Feria De Salud" presented in association with the American Diabetes Association. He is a lifetime member of the American Academy of Ophthalmology, The Retina Society & American Society of Retina Specialists, and is affiliated with numerous hospitals including Memorial Hermann, The Methodist Hospital at St. John Clear Lake, and the oldest hospital in Houston, St. Joseph Medical Center. Dr. Rania Tabet earned her medical degree and her general Ophthalmology degree from the Saint Joseph University School of Medicine, Beirut, Lebanon. She then completed two years of advanced training in Cornea, anterior segment and ocular surface inflammation at the University of Paris VII, School of Medicine and the prestigious Foundation Ophthalmologic of Rothschild, Paris, France. Soon after her relocation to Houston she engaged in a one-year research fellowship in Glaucoma at the University of Texas Medical School at Houston and successfully completed the Educational Committee for Foreign Medical Graduates Certificate. She then went on to complete one-year of Clinical Fellowship in Cornea and Anterior Segment followed by two years of Clinical Fellowship in Vitreo-Retinal diseases and surgery, both from The University of Texas Medical School at Houston, Department of Ophthalmology and Visual Science. In 2013 she received the Richard S. Ruiz, M.D., Award as Outstanding Fellow in Ophthalmology for demonstrating exceptional knowledge and compassion, genuine dedication to teaching, and providing outstanding leadership and guidance in patient care. She has also been trained in the advanced Botox injections for the treatment of chronic migraines, hemifacial spasms, Blepharospasm and a full complement of cosmetic treatments. Dr. Tabet has written peer-reviewed journal publications on diseases of the eye as well as participated in numerous clinical trials. She has presented at the meetings of the American Academy of Ophthalmology, Association for Research in Vision and Ophthalmology, American Society of Cataract and Refractive Surgery Conferences, French Ophthalmologists Society, Medical Contact Lens and Ocular Surface Association, and the International Ocular Surface Society. She also actively participated in the development of a medical book “Complications of Glaucoma surgeries”. She is a member of the American Academy of Ophthalmology, The International Society of Refractive Surgery, The French Society of Ophthalmology.